Do you kids love Playmobil? You are in luck. Amazon have a smashing offer on Playmobil Toys... Buy three and get one FREE! You must buy the toys directly from Amazon and not a third party seller for the offer to be applied. You don't need a code as the FREE item is deducted automatically. This offer is only on until this Sunday (the 25th), so don't leave it too late. Even the Christmas stuff is included in this brilliant Playmobil offer. 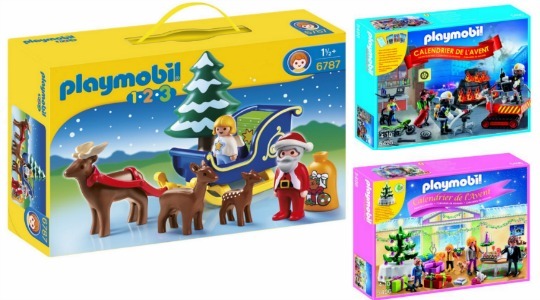 You could get this Playmobil 123 Father Christmas and Sled*, Playmobil Fire Rescue Operation Advent Calendar* and Playmobil Christmas Advent with Tree*for just £34 delivered. This would normally set you back £43.95, so you are saving £9.95. The savings are even better if you needed three of Advent Calendars for instance. If you are buying more than three items and wish to get more than one item for FREE, say you are buying six Playmobil items for instance, you will need to do two separate orders containing three in each. Delivery is FREE if you have Amazon Prime or are spending £20 or more. If you don't have Amazon Prime or are not wanting to spend as much as £20, then delivery will cost you £3.30. Not working for me :/ any ideas? I've added four playmobil items all for sale by Amazon and nothing but postage taken Off at checkout .